Double weave gauze (muslin) X-Large diaper can be used as a toddler diaper, receiving blanket or swaddling blanket. Made of organic cotton. Direct from the manufacturer savings on the lovely, substantial muslin. Save 15% now through Earth Day, April 22 - EXTENDED through April 23. About 39 x 39 inches before washing; about 36 x 36 inches after shrinkage. Unbleached organically grown double weave gauze. After washing is about 36x36 inches. This is one size larger than our size Large Birdseye flat diapers. The fabric is sometimes called muslin. Ours are double weave which means that it is basically two layers of cloth woven together on the same loom at the same time to form one thicker layer. That's an oversimplification of the weaving process but you end up with one layer of thicker fabric than single weaving but it is still a one-layer fabric. Thicker means more absorbent yet since it is really still one layer, it has a nice, soft hand and washes and dries easily and quickly. After shrinkage it is about one square yard of fabric. It is finished on two ends only and the other two ends are self-finished edges called selvadge or selvedge edges, just like our birdseye flat diapers. No dyes! Simple, pure 100% cotton. The cotton was grown according to GOTS organic standards. This fabric is same kind of fabric as our Cloth-eez Muslin Diapers but this is much bigger. Later on, use it as a night diaper for an older one. Beautiful fabric washes easily. Thicker and more substantial than the big store brands. In Europe these are called baby towels. We tend to think of towels as terry cloth so I don't want to call them that but they can be used after the bath to wrap baby. Receiving blankets come in many sizes. A common size for receiving blankets is 28x28 inches. These are larger at 36x36 inches. Swaddling blankets are usually about 47x47, so these are smaller than that (these are 36x36 after shrinkage, 39x39 before shrinkage). Our large birdseye diapers are about 31x31 and our small birdseye is about 28x28 inches. 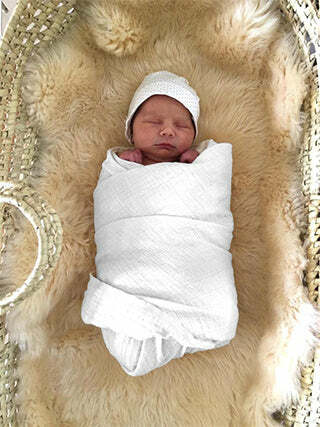 I swaddled my first baby with the 28x28 flannel receiving blankets and they worked fine but I do think a little larger size would have been better for swaddling. It can be used as a swaddle blanket but our intention is for diapering older babies, toddlers and preschoolers. We recommend fastening it with diaper pins. This nice fabric can have many other uses. Since it is plain without any prints or dyes, you know it will match everything now and far into the future when little baby prints aren't really ideal anymore for whatever purpose you find for it. Maybe we should call it a utility-fabric-square-yard-multi-use cloth item. Sold individually because you don't always need a pack of 4 of them. Also consider this as fabric for small home-sewing projects to make various diapers, doublers, wipes or other items. Made of unbleached organic cotton in Pakistan. As a diaper, it ia a little bit more absorbent than a size XLarge toddler green edge prefold diaper! Folded in half and then trifolded it is the same length as a size large brown edge prefold but it is thicker. It will fit in size large or XLarge diaper covers either trifolded or fastened. There are many ways to fold it so it will fit any age toddler or child. This is a good option for toddlers or preschoolers for overnight diapering especially since it will wash cleanly very easily. No dyes or printing that can sometimes feel like paint on the fabric. Dye-free and soft throughout. White made of organic cotton. All pictures are shown after washing. Haven’t used yet because baby is still on the inside. Washed once and it feels great. I have been ruined for other muslin swaddles. I have used mainstream and high end muslin blankets for four babes so far and love them for their versatility (nursing blanket, regular blanket, spit cleanup, flat, Lovie..) . These are the best quality I have found. They are smaller than the going rate of 47”x47”,which would be a con- but make up for it for quality and also doubles as a toddler flat or nighttime flat (which I haven’t used them for, but fully intend to at the latter end of their functional lives).